Trees. Drastic elevation changes. Rock outcroppings. What some builders see as nuisances to be completely removed, Brian sees as an opportunity. Some of his most striking homes sit on challenging topography that other builders wouldn’t touch with the proverbial ten-foot pole. Brian works hard to retain the natural character of the property while balancing the needs and desires of the homeowner. The result is a new home that doesn’t seem so imposed on the property, but more like an established part of it. These are the people who are invaluable to constructing your home: framers, roofers, plumbers, electricians, painters, and finish carpenters. Like any service, some are better than others. “And I am outspoken about my expectations with my subs,” Brian said. He has more than once had workers rip out a day’s work that did not meet his standards. By the same token, Brian understands that a good relationship with subcontractors contributes to quality workmanship, and so he takes good care of them and respects the work they do. His father spent his life as a subcontractor, making him especially sensitive to nurturing good relationships. 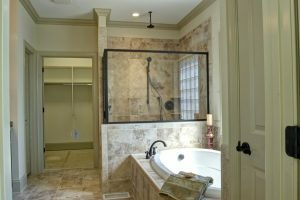 As a result, Brian’s reputation is well-known among subcontractors in Greensboro, NC. He does not have to search out the finest craftspeople, they want to work for him. First-time custom home buyers are often a little overwhelmed at the number of decisions that have to be made: light fixtures, plumbing fixtures, countertops, drawer pulls, windows, doors, hardware; the list can seem endless. It is here that Brian’s talents have served customers well. His knowledge of and relationships with the area’s leading suppliers, coupled with his aesthetic sense and experience, simplify the process for homebuyers. Brian’s ability to communicate and understand your desires and tastes enables him to make choices that simplify the process, alleviating the stress that can come from too many choices. 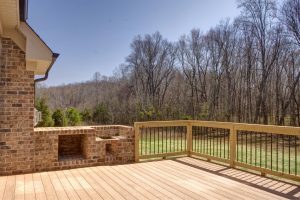 To get a new home underway for your family, call (336) 669-7642.